Posted on April 17, 2018 at 12:05. 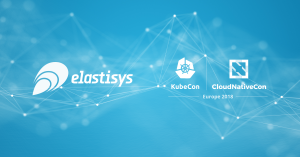 Elastisys joins the Kubernetes and cloud native community at KubeCon and CloudNativeCon 2018 in Copenhagen! Our CEO Robert Winter and our Communication Strategist Lars Larsson will join between May 2-4. Come meet us there and talk with us about our professional Kubernetes service offering, how our team is innovating with monitoring, and what our AI researchers are up to!